Haruka says Team 2. 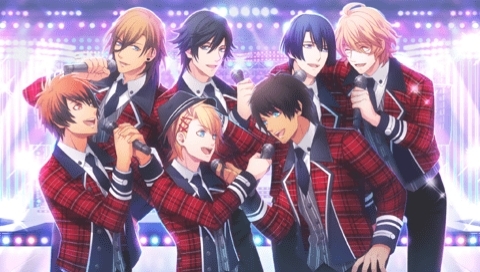 Tokiya is smart, Syo has the athletic abilities, and Cecil is good at encouraging people. Syo was excited, and says he got lucky on the questions. Cecil says he’s also lucky. Syo asks about Cecil’s injury from falling down, but Cecil says it’s no problem. He’s just glad he got the answer right. Tokiya is like, you didn’t know the answer?! Cecil’s like nope, just a guess. Tokiya is amazed. In a broadcast, Hayato says good morning. Haruka watches Ohayahho~ News every morning. Hayato says he’s going to be everyone’s cupid. Haruka remarks at how Hayato has a completely different air about him compared to Tokiya. Hayato as the “Exciting Angel of Love” is going to cast a magic spell so a girl’s love will be returned. He banters with the news host. He ends his corner asking viewers to see him at the movies. Tokiya remarks the broadcast was too energetic. He is sitting on the sofa with Haruka. He critiques his performance. Haruka apologizes since she watches an episode every morning no matter what. Tokiya doesn’t mind. It’s a good way to study his past performance. It’s nostalgic and he doesn’t dislike it so much anymore. He blushes. Haruka says it’s like a dream to compose for a real idol, let alone Hayato/Tokiya. Hayato gives Haruka energy. That’s why she’s thankful to Hayato — no, Ichinose-san. She doesn’t need to say anything, but when she does, it makes him feel like he can accept his past as Hayato. But he’s still different. Tokiya opens the window for more air. Tokiya invites Haruka to the TV station since she’s never gone before. Haruka protests because she’s seen Hayato’s performance and remembers every detail about the skydiving scene. Tokiya says she doesn’t have to remember quite so much, but Haruka replies it was wonderful. Tokiya is a little jealous of Hayato. Haruka is confused. Tokiya asks which one she’d rather have approach her. He presses for an answer, but she can’t choose because they’re both important. Hayato is inside Tokiya. So would either of them do? He talks as Hayato and requests she choose him. Haruka is flustered. Then Tokiya (as himself) says she’s his lover and wants her to look his way. He stops his teasing and admits “both are important” is the answer that makes him happiest. Tokiya remarks she’s grown, but her pure heart and honest self haven’t. He gets strength from her both as a girl and as a composer, and he can even detect her music in CMs and dramas. Haruka is amazed. Well, he can’t lose as her partner. Haruka replies she’d be lost without him. They make a promise to support each other. They smile as the wind blows. 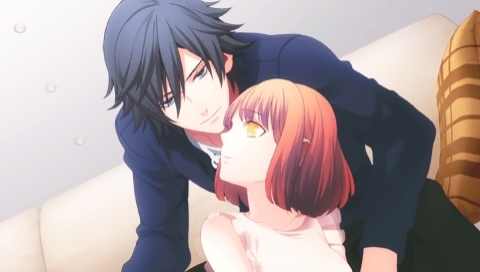 Their hair swirls around, and Tokiya takes this opportunity to kiss her. He makes a comment about her red face and how he can hear her heartbeat. He has her feel his rapid heartbeat as well. That’s why she doesn’t need to be shy. 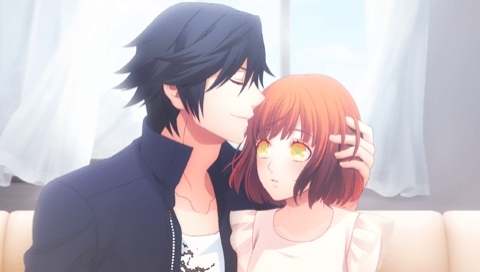 Tokiya wants to feel her more and kisses her cheek. Words aren’t enough. He wants to always stay like this. Same goes for Haruka. After a period of time, she starts getting drowsy. Tokiya calls her name and she snaps out of it. He wants to know what she would like to do now. Haruka wants to stay as they are. He’s worried he’ll fall sleep. They relax the rest of the day. It’s night now and time to work. Haruka has considered ballads and catchy tunes, so she has a couple of demos. But there’s a tune she can’t get out of her mind. She doesn’t know if he’ll like them, but she’s fired up. Tokiya is looking forward to hearing it, so she starts the first demo. The demo finishes playing. He doesn’t say anything. She starts the next one. He’s still silent. So she moves on to the next one. It’s the last demo. Haruka wishes he’d give some kind of advice. He finally says play the last one. She wants to hear his thoughts. He wants to hear the last one before any discussion. Tokiya notices her hesitation. Haruka admits the image is quite different. So it’s a risky song? Yes, Haruka replies. Tokiya tells her to play, so she does. Tokiya murmurs it certainly is quite different. Quickly frankly, he’s surprised. He smiles; it’s her risk. He stands up and chooses this song. Haruka is shocked. This is the song he most wants to sing. He notices her silence. She admits she didn’t think he would pick it. He wants to find a new side of himself. Tokiya wants to test himself, and this is the first step. He’s changed and can bring out the charm of this song. He’ll surprise her — and his fans — even more. They’ll do their best together. Tokiya asks her to describe the image of the song in one word. She says, “Emotional.” She wanted to expand his range of feelings. Tokiya is glad he asked. He loves the song and hugs her. He starts making plans about dancing, lyrics, etc. It will be hard, but he hopes Haruka will accompany him on his journey. She will. She wants to support him in his new challenge. A few days have passed. The song is taking shape. Preparations for the live have begun, so Tokiya has been busy. Haruka hopes to meet him at the agency. Haruka enters and sees Tokiya, Otoya, and Reiji talking to a client. The CM will feature the three of them as brothers. Otoya notes the characters sound like their usual selves. “How we usually are…huh,” Tokiya murmurs. He proposes an image change to appeal to more fans. The client agrees. Haruka greets them after the client leaves. They all head for another room. Otoya remarks it was rare to see Tokiya like that earlier. He usually would just do his best as assigned. Reiji agrees. They’re drinking coffee. Tokiya replies he thought this way was better, but they really want to show a new side of himself. Otoya likes the sound of that. Reiji still thinks it’s rare for Tokiya to take a risk. Otoya wonders if something happened. Reiji begins to make a sly remark about Tokiya being influenced, but Otoya doesn’t get it. Before Reiji can spill the beans, Haruka blurts out it was music. Tokiya quickly backs her up. Reiji says it’s not completely wrong, but he’s a little jealous of “those passionate feelings and having a partner”. Tokiya tells the others a little bit about how the song with show a new him. Otoya wants to hear more about it, but it’s a secret for now. Otoya begs, but Tokiya tells him to wait patiently until the live. Otoya takes this as an invitation and cheers. Tokiya blushes. (Can’t get rid of the BL undertones from Debut, I guess.) Reiji also raises his hand. Tokiya didn’t mean it that way, but if they want to go, he’ll invite them. Reiji wishes him good luck. Tokiya has to go now. Before he goes, he asks Haruka to accompany him to talk about the song. They both leave. Haruka asks about when they should meet for the song. Tokiya goes into the recording room. She inquires about his next location. He smiles and admit it was just an excuse; he has the rest of the day off. He knew the three of them would just chat about nonsense. Besides, when he saw her face, he wanted to sing. And, blushing, he admits he wants to be alone with her afterwards. Haruka is free for the day and feels happy he wants to work on the song together. Truthfully, he has things he’s promised to do, but, well, no time like the present. She’s surprised at his impulsiveness. He’s amazed, too, but he can’t stop the feeling of wanting to sing. She feels the same way about music. Tokiya says music brought them together, so he’s happy she feels the same. He touches her hair. But his love for her is even hotter than his passion for music. He thought he had to explain everything in words. But he’s realized that’s not true. She taught him how to release his inner passion. He’ll show it through this song. It will be his revolution. Maji love revolutions! Haruka wants to test the melody so she can make the best song. Tokiya enters the booth. They do a run through. Tokiya says it felt good to sing. The song’s image is overflowing. He feels like he could do anything and wants to aim higher. They discuss changes. Haruka likes working together. Tokiya is getting a sense of the lyrics. The song will really show a different side of him. He realizes they’ve spent a lot of time in the booth and it’s late. Time passes by when he’s with her. They’ll go home. Walking home at night, Haruka wonders if it’s okay to be seen like this. Tokiya responds it’s a rare chance. The town is sparkling and they stop at a spot he’s told her about. He also tells her to act confident to avoid standing out. “Besides, I don’t always have to be a serious, good boy, right? Or do you prefer my usual self?” She replies being different from usual isn’t bad. It’s thrilling, and not knowing makes her heart pound. Tokiya teases he should continue being a bad boy. If she likes it, then she might have a hard time. She protests, but he would like to see her troubled. So he kisses her cheek. Haruka cries out what will happen if they’re spotted. He apologizes but just wanted to be a bit naughty. They continue their walk amidst the lights, but then Tokiya stops. It’s a nice spot to look at the scenery. He remarks on the beauty of the city lights, but in exchange, the stars can’t be seen. He admits he’s wanted to go on a normal date with her. Does she think that sounds stupid? Of course not! Haruka is the same and is happy. Tokiya was worried since she never complains. As an idol, he can help grant her dream of singing her song, but he can’t fully fulfill the role of her lover. She deeply thinks about this. Tokiya didn’t mean to make her feel upset. He hugs her. Haruka tells him she’s happy just being his partner and to wish for anything more is extravagant. Tokiya is taken aback. He wishes for more, and he told her before: he isn’t always a good boy. He wraps his arms around her and pulls her toward him. Haruka insists he let go for fear of being spotted. He doesn’t. And he doesn’t really care. He kisses her. Tokiya murmurs this is normal for lovers and kisses her again. He won’t let her escape and maintains they won’t be seen before kissing her again. Before Haruka admonishes him, he just gazes at her. He says sorry but wants to stay like this a little longer. She returns the embrace. He’s happy she’s being so forward. She’s still worried, but he’s engrossed in her right now and these feelings. After a while, he asks if she’s chilly. She’s warm thanks to him. He smiles and says that warms his heart. She’s still surprised at him tonight, and he reminds her that’s the previous him. He is aware of his image of himself he created, so he wants to change it as both an idol and a lover. Others may not understand, but it’s something he has to do. Tokiya can change with her and feels like he has more courage even now. She sees a lot of changes in him already. She wants to be like Tokiya. He smiles and reminds her this is their challenge together. It wouldn’t have begun if it weren’t for her. He wants to aim higher and give a people a lot of dreams as an idol. And he will love her more than anyone. She replies he’s already good enough, but he’s not satisfied, so she best be prepared. Haruka understands and smiles. He loves her smile and kisses her hair a few times. She’s shy again. She thinks to herself she’s shy no matter how many times they’ve kissed and she loves even the unknown parts of him. Tokiya says she needs to work on her private and public girlfriend self, so let’s go home for another test. He tells her to think where she wants to be kissed next. She squeaks out a “yes” before they begin walking. She wants to hurry up and convey the melody inside. Haruka, at home, thinks about Tokiya’s words from the other night. She believes he’s already given a lot of people dreams. He’s amazing and she’s always thought so. But he’s still changing, so she can’t look away. She’s changed, too. She wants to create a future with him. Haruka wonders what kind of lyrics he’ll write. Since the song is different, the lyrics will be different. She can’t help her curiosity, so she texts Tokiya and also mentions the song is almost done. He texts back he was thinking about them and wants to come over. Even though it’s 8 PM, she wants to see him. He’s on his way. Tokiya arrives. Haruka goes to make coffee, but he wants to hurry and listen to the song. Hearing his excitement, she goes to play and puts both his dream and hers into her performance. Her songs always move his heart. He hugs her. He loves her and kisses her forehead. It’s a wonderful song, so now he’ll work on the lyrics. He gets ready to leave. He notices she has somethings she wants to say. Haruka finally asks him to stay. He tells her thank you, much to her surprise. He blushes and adds she said what he wanted to say. They smile. Tokiya tells her her presence inside him is getting larger. New feelings keep being born. Haruka feels the same. He remarks they’re both alike in the sense they tend to overthink things and they get lost in music and each other. That shows they have compatibility, right? Haruka giggles and agrees. Tokiya has been busy. One night, he texts Haruka saying the dance is coming along. He sends another one right afterward inviting her out for a walk tomorrow morning during his morning run. She’ll go. Back at home, Haruka is looking forward to tomorrow. She doesn’t want to get in the way of his running. She wakes up. Her phone rings. She panics. She answers and apologizes, thinking she is late. Tokiya replies it’s a good morning call. He likes hearing her voice this early. He’ll pick her up a little later. She is going to hurry and get ready. Her doorbell rings. Tokiya greets her. He winks and offers to give her a wake up kiss if she’s still sleepy. She knows he’s teasing her. Laughing, he rephrases: can he kiss her? He pulls her close and kisses her nose. They’re off. Tokiya remarks it’s a nice feeling being out early. It’s quite peaceful, Haruka says. She asks if this slow pace is okay. He’s always running, so he thought he’d walk for a change. He questions Haruka if she knows why he started running. She guesses it’s refreshing. He reflects on himself every morning. It used to be for health reasons, but it changed into self-examination. It’s a big difference, though. Haruka wonders what he means. Having her by his side, he responds. He’s still got to think about the lyrics, but he’s pumped. Haruka asks what kind of lyrics he’s writing. Tokiya replies she’ll probably be shocked. She’s very intrigued. It’s about his feelings. He’s looking forward to her reaction. They pick up the pace so they can return home. Haruka is tired. Tokiya offers to give her a massage when they get back, but she protests he has work. He tells her not to hold back and they slow down. Haruka collapses on the sofa from exhaustion. The walk was tiring but refreshing. Tokiya teases her and asks her to join him everyday for running. Haruka makes up an excuse saying she couldn’t concentrate on her work. Tokiya laughs but welcomes her to come along anytime. He’s going to give her that massage now. Haruka tries to decline, but he tells her just to accept it. He tells her to relax as he begins. It feels good, and he tells her to relax some more. It’s the same for work: if you’re too tense, you won’t get a good result. Both Reiji and Otoya told him to enjoy his work more. Tokiya didn’t get what they meant, but lately he understands. He couldn’t figure it out alone. Haruka giggles. Tokiya blushes and says the others were more like a guide of how not to act. The massage is over; time for stretching. Haruka thinks to herself he’s a Spartan trainer (strict). She’s happy to learn something new about him every day. The day of the live arrives. Haruka is hanging out in the crowd. The lights come up. Tokiya appears. The show is excellent. Tokiya talks to the audience. He has a surprise for them. They’re interested, and he asks if they’re ready. The crowd applauds. They get excited when they learn it’s a new song. He explains it’s different than his usual fare, and it’s his challenge to himself. Tokiya talks about his image versus their image of him. He looks at the audience and smiles. His image may change, but he’ll always be himself. Tokiya isn’t going to say they have to accept all of him but asks to just listen. 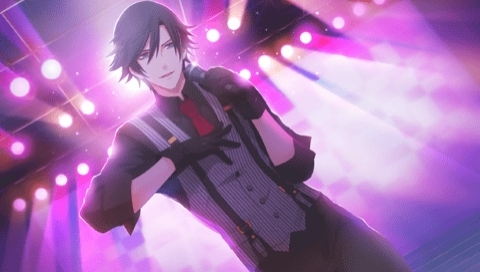 “Where is my true self?…He’s here.” Tokiya then sings “Independence“. Haruka and the audience are enchanted. It’s a powerful performance. They cheer. Her eyes are misty from tears. It was dazzling. Tokiya is panting from exhaustion but asks if they saw the hidden side of him. They cheer louder. There may be other faces of himself so he’d like them to follow him. They applaud. The live is over and Haruka wants to see Tokiya. She should let him rest, but she wants to tell him. She’s about to text him when she gets one from him: “Urgent: Please come to the dressing room.” She’s on her way. Tokiya is chatting with the staff. Haruka doesn’t want to be in the way, but she still wants to talk to him. He spots her and comes running up. She congratulates him, and he smiles broadly. He’s glad he got to sing her song. Haruka admits she’s so moved she can’t express it. Tokiya feels the same. Haruka is still speechless. Tokiya finally says he’ll be late, but he wants to see her no matter what. Haruka asks if it’s alright. He wants her opinion, so is that a yes? She says yes. He gives her a keycard and tells her to wait there. It’s a little far but closer than his place. He winks, and leaves. Haruka is nervous as she arrives. It’s a gorgeous room with a bed, sofa, and a table. The sofa is so comfortable. But he didn’t tell her it was a hotel. She relaxes on the sofa and waits. She really wants to see him. As she closes her eyes, she remembers his earlier performance and the lyrics. It’s like she can still hear them. The crowd cheers wildly. Haruka is amazed. It’s a new face of his. Panting, he thanks the audience. The next song starts. Haruka can feel his strong emotions. She falls in love even more. The live ends. She closes her eyes to think about what she feels. She wants to see him. She heads off and spots Otoya and Reiji. Haruka chases after them. They’re wearing glasses to hide their identity. Otoya likes the new song, saying it’s a Tokiya he’s never seen before. Reiji is also surprised. They wonder about the line “where is my true self”. The three head to see Tokiya. Tokiya is a little surprised to see all of them. They wouldn’t have missed it for anything. The three chat about the performance. Haruka congratulates him. Tokiya would love to talk, but he has things to do, so they’ll talk later. Reiji and Otoya say their goodbyes, and Haruka goes to head off with them. 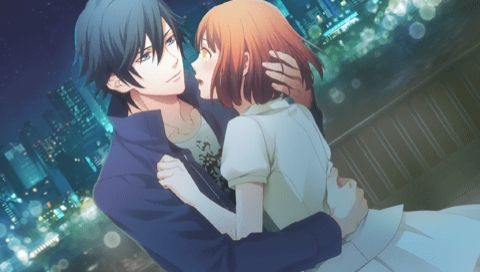 Tokiya escorts them out and whispers to Haruka he has tomorrow off. She’s looking forward to seeing him. Tokiya comes over to Haruka’s. She opens the door and immediately starts raving about the live. He laughs and tells her to calm down, he’s not going anywhere. He thanks her for her compliments. He adds the live even made the news. They read the good comments about the “charismatic super idol”. He blushes. Haruka insists it’s because the fans were touched. He was moved by all the smiles. But he still wants to aim even higher. Tokiya’s still embarrassed by all the praise. She studies his face and giggles. He wants to know what’s so funny. Finally Haruka says he’s got bed-head. He can’t believe and tries to fix it. She says it’s his day off and thinks it’s kind of cute. He’s still embarrassed. He starts to head off to look in the mirror, but Haruka offers to fix it. Tokiya wants to be spoiled by her. She grabs a towel and a dryer. She starts combing it. He makes a noise, and she apologizes for hurting him. It’s not that; it actually feels good. She likes him being spoiled since she’s usually the one being spoiled. She turns on the dryer and he yawns. She giggles. His hair is done. Does he seem like a charismatic super idol now? He feels uncool. Haruka agrees, much to his shock. Right now, he’s a charismatic super lover! She’s the one who supports him. He can become stronger. He hugs her shoulders. He’s different now; he feels happiness and joy. He whispers thanks for being with him. Tokiya tells Haruka he loves her. He kisses her. Just by kissing, he’s in paradise. Haruka says their feelings are expressed. He’s confused. Even without words, they can understand by touching, she replies. He thinks their souls are connected. They don’t need words, so he suggests feeling with love. Tokiya kisses her again. She enjoys being in his arms.